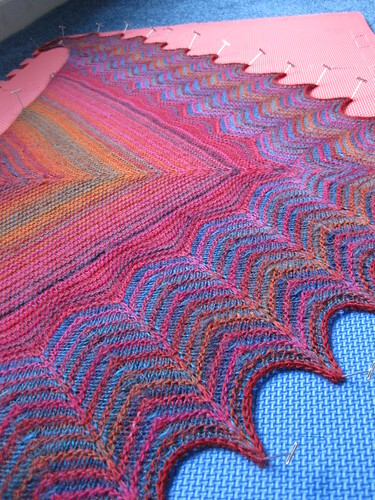 This may be my favorite project ever, I loved the yarn, I loved the simplicity of the pattern, and I couldn’t stop taking photos of it. Taking a weekend away to drive up to New Hampshire, we stopped in Newburyport for a late breakfast. I pulled out my ‘yarn store finder’ app from the ravelry.com people and discovered I was 43 feet away from a yarn store, A Loom with a View. Gotta buy something, it’s vacation, right? 43 feet? Hell ya. So I came out with 2 skeins of Mini-mochi and one of a Madeline Tosh Sock yarn. I took these photos with my iPhone using the white bag they came in as a lightbox, I uploaded them to flickr right away. So I pulled it all out, down to a nub, and then considered speaking to a therapist. I cut out all the blue after seeing that there was more orange and pink than blue after looking at the color cards. Then I went to town on this, keeping the blue aside until I got to the contrasting colors. Eventually I realized I needed to order a 3rd Mini-mochi skein from the store in Newburyport to finish this project… but here’s how it came out. Love, love, love it. 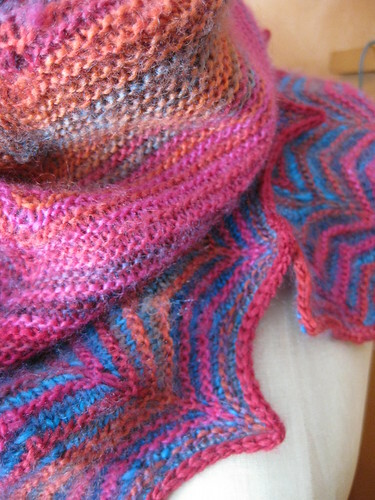 I used this for my March project in the BSGFPB game we have going at ravelry. 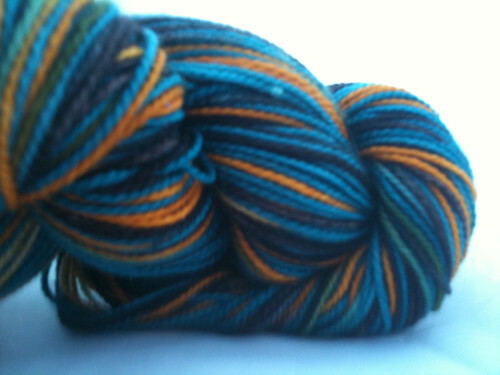 And it ended up winning me a hand dyed skein from Kesten. (!!) So awesome. But wait! There was part of a skein of Mini-mochi left over… what did I do with it you ask? Found some lovely soft yarn (forgot the name, unfortunately) and made my aunt a hat. She used to crochet me all sorts of things when I was little, so I figured it was time to knit her something. Oranges and reds are her colors, and the colorway was perfect for this type of simple rib stitch hat. 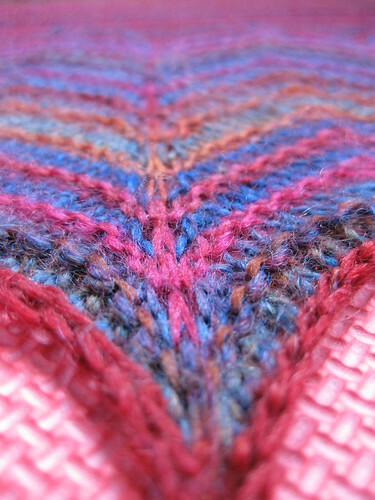 I joined ravelry on September 23, 2007. 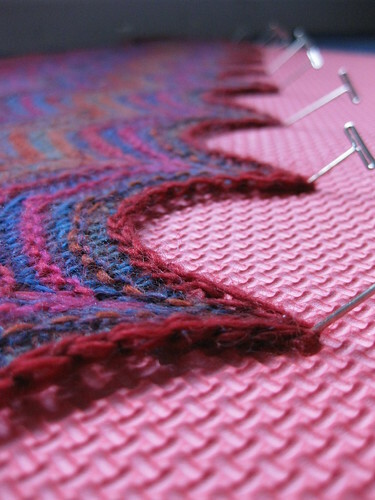 As I move my blog to wordpress (April 2012) I am looking back at how my knitting work has changed for the better, simply by joining up and sharing ideas and inspiration with all the great ravelers (& now friends). 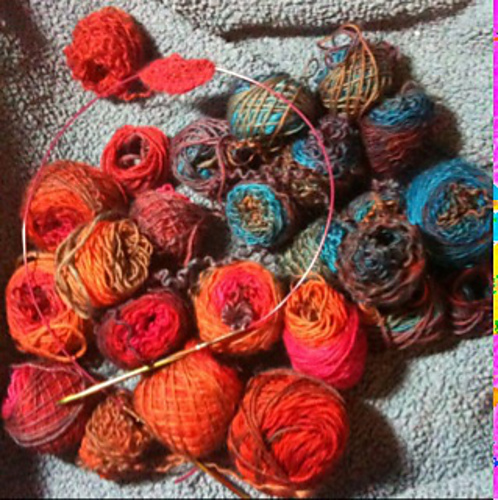 So if you arrived at this post by searching on the “knitting” keyword look at how crappy the stuff that came before this point was compared to the work that came after. I got a picture of my adorable niece, Triniti, wearing the Santa Hat I made for her. How cute is she?!?! This lil hat was for my newborn niece to wear while watching the Superbowl. I ordered a skein each of red, white, and blue of Lion Brand’s Pound of Love from an online site… it turns out each skein is HUGE – definitely each one is bigger than the baby. I don’t know when I’ll ever use this stuff up. If anyone knows a team of elves that needs hats… or perhaps some cold patriots? Finally, months after the fact, I’m uploading a few things I’ve done over the winter. Here’s a hat made from Manos De Uruguay yarn for April to wear this winter. I made these for Trinii w/ Crayon’s Lite cotton yarn before she was born. made with the same Thick and Quick (Lion Brand) yarn that I made my first hat with. I did a rib stitch, and it came out smaller than I expected. Not bad for a first project… I saw a how to knit article in Real Simple magazine and figured I’d give it a go.